To the lawful, surviving spouse of the service member, if any. If there is none of the above, to the duty appointed executor or administrator of the estate of the service member. If there is none of the above, to the other next of kin of the person entitled under the laws of domicile of the person at the time of the person's death. If a designated beneficiary dies before receiving the amount to which entitled, such amount is then paid to the living survivor(s) first listed above. If a Soldier dies from a Service-connected injury/illness, a claim should be made to the VA for their Death Gratuity determination. When a Soldier who has worked and paid Social Security taxes dies, certain members of the Family may be eligible for monthly benefits. Generally, the Soldier must be either Fully Insured (up to 10 years of work credit is needed to be eligible for benefits, depending on the person's age) or, Currently Insured (earned at least 6 work credits in the preceding 13 calendar quarters). Under a special rule, if a Soldier worked for only 1½ years in the 3 years before the death, including civilian covered wages, benefits can be paid to minor children and/or the spouse who is caring for the children. Former spouses may qualify for survivor benefits if certain conditions are met. In cases where the Soldier does not meet any of the above criteria, and the death was on active duty or active duty for training and is determined to be service-connected, a special gratuitous allowance is paid by the Department of Veterans Affairs (VA) under Title 38 U.S.C. 1312(a). The Social Security Administration certifies the benefit entitlement, eligible beneficiaries, and amounts payable. dependent parents age 62 or older. Benefits depend on the Family status of the deceased. The amount depends on the total work experience of the deceased and the amount of Federal Insurance Contributions Act (FICA) tax contributions made during that period. A one-time payment of $255 can be paid to the surviving spouse of a deceased Soldier if he or she was living with the deceased, or, if living apart, was receiving certain Social Security benefits on the deceased Soldier's record. If there is no surviving spouse, the payment is made to children who are eligible for benefits on the deceased's record in the month of death. If no spouse or child meeting these requirements exists, the lump-sum death payment will not be paid. The deceased Soldier must have been either fully insured or currently insured under the Social Security system. Generally, the benefit is paid only to eligible survivors who were already receiving or are eligible to receive immediate monthly benefits derived from the earnings record of the deceased. Former spouses are not eligible for this benefit. The benefit may not be paid directly to a funeral home. Military duty status at time of death is not a factor in determining eligibility. You don't have to report the death to the DEERS database of information on uniformed services members (sponsors), U.S.-sponsored foreign military, DoD and uniformed services civilians, other personnel as directed by the DoD, and their family members. You need to register in DEERS to get TRICARE. If you have questions, call DMDC at +1 (800)538-9552. Visit MilConnect to learn more. When your 3-year period ends. Survivors' and Dependents' Educational Assistance (DEA) Program is established by Chapter 35 of Title 38 U.S. Code. The DEA Program provides education and training opportunities for eligible dependents of Veterans who are permanently and totally disabled due to a service-related condition, or who died while on active duty or as a result of a service-related condition. The program offers up to 45 months of education benefits. These benefits may be used for degree and certificate programs, apprenticeship, and on-the-job training as well as correspondence courses for spouses. Remedial, deficiency, and refresher courses may be approved under certain circumstances. a Veteran who died or is permanently and totally disabled as the result of a service-connected disability. The disability must arise out of active service in the Army. A Servicemember who is hospitalized or receiving outpatient treatment for a service connected permanent and total disability and is likely to be discharged for that disability. This change is effective as of December 23, 2006. Spouses and surviving spouses have 10 years from the date VA establishes eligibility to use the benefit. Surviving spouses of Veterans who died while on active duty may use DEA 20 years from the date of the veteran's death to the benefit. If the VA rated the Veteran permanently and totally disabled with an effective date of up to 3 years from discharge, a spouse will remain eligible for 20 years from the effective date of the rating. Children may use DEA between the ages of 18 and 26, regardless of marital status. Note: These limits can be extended under certain circumstances. For details, please visit the web site shown below. The amount VA pays is based on the type of training program and training time (i.e. full-time, half-time, etc). Benefits are paid monthly and in arrears. If attendance is less than a month or less than full-time, payments are reduced proportionately. Different payment rates can be found on the VA website shown below. You can apply by filling out VA Form 22-5490, Application for Survivors' and Dependents' Educational Assistance, and submit it to the VA. You can also apply through the VA's website. What is the Marine Gunnery Sergeant John David Fry Scholarship? Full tuition and fees paid directly to the school for all public school in-state students. For those attending private or foreign schools tuition and fees are capped at a statutory maximum amount per academic year. Children and surviving spouses of an active duty member of the Armed Forces who died in the line of duty on or after September 11, 2001, are eligible for this benefit. A child may be married or over 23 and still be eligible, although their eligibility ends on their 33rd birthday. A spouse will lose eligibility to this benefit upon remarriage. If the child is eligible under the Montgomery GI Bill Active Duty, Montgomery GI Bill Selected Reserve, and/or the Reserve Educational Assistance Program (REAP), then he or she must relinquish eligibility under one of those programs to receive benefits under Post-9/11 GI Bill. A child's character of discharge from his or her own service does not impact eligibility resulting from the line of duty death of a parent. A child on active duty will receive benefits at the active duty benefit rate. A child may qualify for up to 36 months of benefits under the Fry Scholarship Program and possibly another 36 months of benefits of the Post-9/11 GI Bill based on their own service. An individual may also receive additional entitlement if another parent transfers entitlement to the individual. If a child is eligible for the Fry Scholarship, he or she may be eligible for DEA. Although the benefits cannot be used at the same time, a child may be eligible for up to 48 months of benefits between the two programs. Find out more about DEA at Survivor and Dependent Education Assistance. Surviving spouses must make an irrevocable election of which benefit he or she wishes to receive. An election to receive DEA will forfeit the individual's right to receive Fry Scholarship in the future, and an election to receive the Fry Scholarship will forfeit the individual's right to receive DEA in the future. The election cannot be changed once it has been submitted, so you should carefully review eligibility and entitlement under both programs before making a decision. To apply, obtain and complete VA Form 22-5490, Dependents' Application for VA Education Benefits. Send it to the VA Regional Processing Office with jurisdiction over the state where you will advance your education and training. If you are a son or daughter, under legal age, a parent or guardian must sign the application. Be sure to explore potential programs and how much you could receive using the GI Bill by visiting the GI Bill Comparison Tool at GI Bill comparison tool. For more information, call toll-free 1-888-GIBILL-1 or visit Survivor Education and Training. The transferability option under the Post-9/11 GI Bill allows Servicemembers to transfer all or some unused benefits to their spouse or dependent children. The request to transfer unused GI Bill benefits to eligible dependents must be completed while servicing as an active member of the Armed Forces. The Department of Defense (DoD) determines whether or not you can transfer benefits to your family. Once the DoD approves benefits for transfer, the new beneficiaries apply for them at VA. To find out more, visit the DoDs website or apply now. Upon approval, family members may apply to use transferred benefits with VA by printing, completing, and mailing the VA Form 22-1990e to your nearest VA regional office of applying online. VA Form 22-1990e should only be completed and submitted to VA by the family member after DoD has approved the request for TEB. Do not use VA Form 22-1990e to apply for TEB. If a Servicemember wants to reallocate transferred benefits they can do so using the TEB Portlet in MilConnect at www.dmdc.osd.mil/milconnect. If a Veteran wants to reallocate benefits they should contact the VA using our "Ask A Question" website http://gibill.custhelp.com. If transferred benefits are totally revoked for a dependent a Servicemember must resubmimt a transfer request for the dependent via MilConnect, a Veteran cannot re-transfer benefits to a dependent if the dependent's transfer eligibility was previously totally revoked. Are not eligible for the monthly housing allowance while the member is serving on active duty. Can use the benefit for up to 15 years after the service members last separation from active duty. May not use the benefit until he or she has attained a secondary school diploma (or equivalency certificate), or he or she has reached age 18. Is entitled to the monthly housing allowance stipend even though the eligible individual is on active duty. Eligible family members occupying government housing on the date the member dies may continue to occupy such housing without charge for a period of 365 days provided member's death was in the line-of-duty. If they vacate the government housing before the 365 days are up, the Basic Allowance for Housing (BAH) is paid for the remaining unused days. If the family members are not occupying government housing, they may receive BAH or an overseas housing allowance for 365 days after the member's death. Your Casualty Assistance Officer will explain this entitlement to you and help you complete the required claim form. Section 1001 of the American Recovery and Reinvestment Act expanded the HAP authority to authorize the Secretary of Defense to provide financial aid to members of the Armed Forces (30% or greater disability) who incur a wound, injury, or illness in the line of duty during a deployment in support of the Armed Forces on or after September 11, 2001; wounded DoD and Coast Guard civilian homeowners reassigned in furtherance of medical treatment or rehabilitation or due to medical retirement in connection with a disability incurred in the performance of his or her duties during a forward deployment occurring on or after September 11, 2001 in support of the Armed Forces; and surviving spouses of fallen Warriors who move within 2 years of the death of such employee or member. Wounded, Injured, or Ill members of the Armed Forces – Any member of the Armed Forces in medical transition who 1) incurred a wound, injury, or illness in the line of duty during a deployment in support of the Armed Forces on or after September 11, 2001; 2) is disabled to a degree of 30% or more as a result of such wound, injury, or illness, as determined by the Secretary of Defense; and 3) is reassigned in furtherance of medical treatment or rehabilitation, or due to medical retirement in connection with such disability. In addition, the home for which HAP benefits are being requested must have been the applicant's primary residence at the time of the relevant wound, injury, or illness. Wounded, Injured, or Ill Civilian Employees of DoD or the United States Coast Guard – Any civilian employee of the DoD or the United States Coast Guard who 1) was wounded, injured, or became ill in the performance of his or her duties during a forward deployment occurring on or after September 11, 2001, in support of the Armed Forces; and 2) is reassigned in furtherance of medical treatment, rehabilitation, or due to medical retirement resulting from the sustained disability. In addition, the home for which HAP benefits are being requested must have been the applicant's primary residence at the time of the relevant wound, injury, or illness. Surviving Spouses – A spouse of a member of the Armed Forces or a civilian employee of the DoD or the United States Coast Guard may be eligible when 1) the member or employee was killed in the line of duty or in the performance of his or her duties during a deployment on or after September 11, 2001, in support of the Armed Forces or died from a wound, injury, or illness incurred in the line of duty during such a deployment; and 2) the spouse relocates from such residence within 2 years after the death of such member or employee. Foreclosure: Benefit is paid to the lien holder for legally enforceable liabilities. The Defense Commissary Agency (DeCA) oversees the operation of a worldwide chain of military commissaries. DeCA commissaries provide groceries for cost plus 5% surcharge. Purchasing goods from the commissary saves a family an average of more than 30% compared to shopping at civilian grocery stores. Commissary use is available to Regular Army, Army National Guard, and Army Reserve Soldiers, to Retirees, and to qualified dependents. Authorized shoppers are required to possess and show a Uniformed Services' Identification Card (ID). Authorized commissary patrons as defined by Department of Defense Instruction 1330.17, Armed Services Commissary Operations, include active duty, Guard and Reserve members, military retirees, Medal of Honor recipients, 100 percent disabled veterans, and their authorized family members. Please refer to this instruction for a complete list of authorized commissary patrons, including organizations and activities, along with qualifications and any exceptions such as access to U.S. commissaries overseas. The Defense Commissary Agency has no authority to determine whether a person is authorized to shop in the commissary. If you believe you may be entitled to commissary privileges, visit your local installation Pass and ID office for information about military benefits and to obtain an ID card consistent with your entitlements. Commissaries are grocery stores, usually located on military installations, which sell food products and assorted goods. Authorized patrons purchase goods at cost plus 5% surcharge. The surcharge covers the costs of building new commissaries and renovating existing ones. This benefit saves a family an average of more than 30% on groceries as compared to commercial market prices – savings amounting to thousands of dollars annually. For a current savings figures for various groups – single member up to a family of seven – visit www.commissaries.com and click on the "See Your Savings" tab in the upper right corner of the page. In overseas areas, Status of Forces Agreements (or other international agreements between the host country and the United States) determine access to commissaries and to the purchase of duty-free goods sold in these commissaries. Overseas military commands publish regulations of commissary access based on the terms of these agreements. These regulations differ by country. Contact the particular installation Pass and ID office in the country of interest to determine commissary privileges. Besides Survivor Outreach Services, there are several other organizations that may also provide aid and support to survivors. TAPS is an organization that is dedicated to supporting anyone and everyone who has ever been affected by a service member's death that occurred on active duty. TAPS provides, at no cost to the survivor, a national peer support network, grief-counseling referral service, crisis intervention (24 hours a day) and case worker assistance. You may call 1-800-368-TAPS (+1 (800)368-8277) to speak with a TAPS counselor. They also publish a quarterly newsletter. 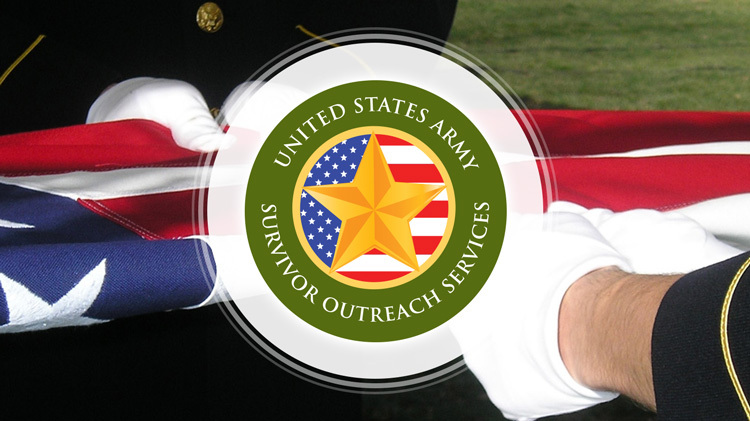 Gold Star Wives of America (GSW) is an organization of and for survivors of servicemembers who died on active-duty or whose death was related to service-connected disabilities. GSW represents survivor's interest before Congress, because survivor benefits are different from servicemembers, veterans and families. The primary purpose of Gold Star Awareness is to provide emotional, peer, and resource support to Gold Star families who have suffered the death of a loved one who died while serving in the United States Armed Forces, and inform the military and public of the significance of the Gold Star Lapel Button and the families who wear it. Provides emotional, educational and financial assistance to families affected by a loss or severe disability and those who fall through the cracks or lie within the "grey area", such as rising stateside deaths of our military personnel. These families fall outside the government agencies and other charitable organization's guidelines. The Society of Military Widows gives moral support, advice, referral service and, in general, help to widows of career military members to return to the mainstream of normal living. It also educates the American public concerning the problems and needs of military widows in today's society. Their mission is to serve the children of fallen military personnel who have given their lives on active duty while defending the United States of America through birthday celebrations, mentorship programs, and college scholarships. Since 2006, the mission of Snowball Express has been a simple, yet profoundly important one: Provide hope and new happy memories to the children of military fallen heroes who have died while on active duty since 9/11.